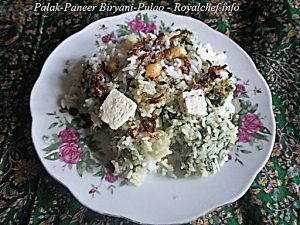 This is a step-by-step Recipe for making at home tasty and delicious Palak Paneer Pulao -Biryani. This Pulao, which is prepared using Paneer and Palak as the main ingredients is rich, nutritious and filling and can be served as a main course rice dish at home or for any kind of parties. Clean and wash the Rice and keep it aside for 20-30 Minutes. Finely chop the Onion. 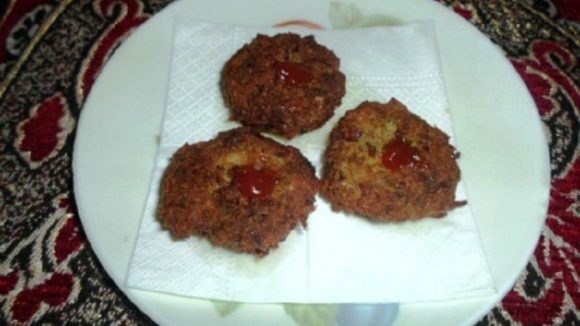 Heat the Oil in a Kadai and add the Onion and a teaspoon Sugar and them deep- fry the Onion on a slow flame until the color changes into light brown or crispy. Then deep-fry the Cashew nuts and keep them aside. Cut the Paneer into 1” size pieces and deep-fry them on a slow flame until the colour changes into golden. Clean and Wash the Palak (spinach) and grind it in a grinder to prepare a thin paste. Finely chop the Onion and Tomato and keep them aside. Heat the Oil in a Kadai and add the Pepper Corn, Cinnamon, Cloves, Bay Leaves, Cardamon, Onion, Tomato, Ginger-Garlic-Green Chili Paste and saute for five minutes on a slow flame. Then add the Red Chili Powder, Cumin-Coriander Seeds Powder, Salt, grounded Palak and mix it well and cook for 5 minutes on a slow flame. Then add the Paneer Pieces and mix it well. Remove the vessel from the flame. In a big size vessel spread the one portion of Rice and then spread the Palak-Paneer mixture over it and then apply a layer of the remaining Rice and add two tablespoon Ghee over the Rice. Cover the Vessel with a plate and cook the Biryani for 10-15 minutes on a slow flame. While serving garnish with fried Onion, Cashew nuts and Paneer.